Blog 1 - The Beginning - Guardian Angel Alpacas Inc.
Hi, my name is Salted Caramel Biscotti, but you can just call me Biscotti. I’m an alpaca! Not a lot of humans know what alpacas are, so let me tell you about us. We are definitely, not llamas (“Not the llama, not the llama!”), but we are related to them and camels too! We are part of biological family Camillidae or camelids! Camelids do not have hooves, rather we have two-toed feet with toenails and soft foot pads. Just like other camelids, we have a three-chambered stomach as well. 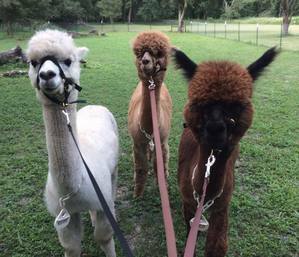 There are two distinct breeds of alpacas: Huacaya (pronounced wah-KI'-ya) and Suri. Huacaya, have full, soft, puffy fleece while Suris have shiny, penciled fiber that hangs down in “dreadlocks.” I’m a Huacaya! Also alpacas are native to Peru, Ecuador and Bolivia, but many are borned and raised in North America, like me! 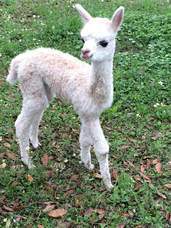 Baby alpacas are called Cria’s. So now that you know a little more about alpacas, ready to hear about me? ​Let’s start at the beginning! I was born March 31st, 2016 in Odessa Florida at Goldenspirit Alpaca ranch. So, I’m a Floridian Alpaca! I remember feeling warm when I took my first breath, while gently laying on soft cool grass. I could feel the breath of someone smelling me and when I finally was able to open my eyes, I saw a beautiful, smiling face. It was my mom and her name is Candi. I would quickly learn that she is the best mom in the whole alpaca world! After a few minutes, I figured out how to stand up and started to walk around. could feel the grass on my feet and it tickled me. Mom motioned me over and showed me where I could get some sweet, delicious milk! It tasted so good and would be my nutrition for the next several months. Mom always made sure she was available whenever I got hungry, which was all the time! After my first meal, the second face I saw was another little Cria just like me. His name was Nico and he was born a few hours before me. From that moment on, he was my best friend! He was also a little wobbly trying to walk, but in no time the two of us learned how to run, jump and chase each other around. His mom and my mom kept watch over us as we explored the pasture, seeing how far we could go, before it got too scary! When we went too far, we turned around and ran back to our moms. Being brave so soon was not easy! ​Before long a couple of humans came over to us, picked us up, wiped us off and weighed us. I was a little scared, but mom told me they were nice and not going to hurt us. I trusted mom, so I didn’t struggle or run away. Other humans came, picked us up, smiled and said things I didn’t understand. They were all very nice to us and petted and fed our moms. After a couple of days mom told me, we were going to meet some new friends. Nico and I followed our moms into a bigger pasture. In there were about 10 other Crias like us with their moms. There were both Huacayas and Suris, all different colors, some were boys and some were girls! Nico and I ran over to them to introduce ourselves even though some of them were a little older and bigger. They sniffed us and welcomed us right away. We were excited because this meant we were part of our first, real herd! There was also a huge hill in the pasture that we learned from the others was to play a game called “king of the hill!” Everyone would run up to the top of the hill and jump off! Over the next few days and weeks, more Crias and their moms arrived. 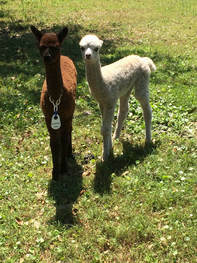 Our Cria herd grew to over 20 and made all our Cria games even more fun! Even though we had all these new friends, Nico and I still hung close together. That’s what best friends do! And at night, when it got dark and a little scary we always snuggled and slept safely next to our moms. We were trying to be big boys, but we still needed our moms and our moms still needed to care for us! Nothing beat mom's sweet milk to fill my belly, but I was soon getting big enough to start eating grass and hay. At first it tasted funny and tickled my tongue, but it didn’t take long until I started to really like it. Nico and I quickly learned how to graze like big boys! Nothing was better than to hang in our herd, munching on the sweet, tasty grass, especially after a rain storm! All the moms kept their eyes on us, even when we started exploring further in the pastures! Most of the moms were really nice, but none was better than my mom. At night, she would tell me stories about my dad and grandparents. How they all were also all born on this ranch and the importance of our heritage. My dad, Dante was a herdsire and my grandfather, Brilliance was a world class herdsire, because of his outstanding fleece. My mom’s dad who is my other grandfather named Rough N Ready was also a herdsire. The exciting stories made me dream of someday being a herdsire too? Over the next few weeks me, Nico and the other boys would look over at the herdsires’ pasture and watch them, so we could learn. We still had a long way to go, but we were growing up fast and couldn’t dream of what the future had in store for us. Nico and I when we were a couple of days old and now! ​Best friends always side by side!